It is not okay to choose only one method in ecological risk assessment. Are the metals causing adverse effects to the environment? In the ecological risk assessment of metals in lake sediment, you can choose several types of methods: chemistry, modeling, evaluating local biota or conducting laboratory toxicity tests. How many methods are enough to say for sure? In our recent paper, authored by Krista et al., we faced this problem. 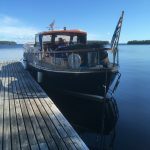 We studied the Finnish lakes under the influence of metal mining and looked at the situation from several different views. In our earlier study, we started with analyzing metal concentrations – high in sediments, moderate in water. 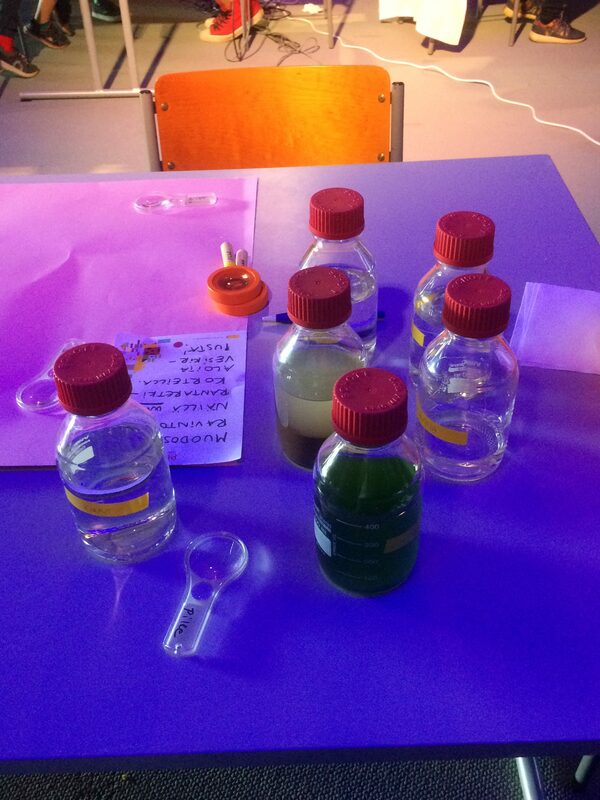 We analyzed the water and sediment chemistry – soft waters, high DOC, high seasonal variation in O2. Based on the chemistry and environmental quality guidelines, there seemed to be increased risk in those four study lakes. In this current study, we included toxicity tests (L. variegatus, C. riparius, V. fischeri, L. stagnalis) to the picture, together with analysis of macroinvertebrate community structures and metal bioavailability & bioaccumulation studies. 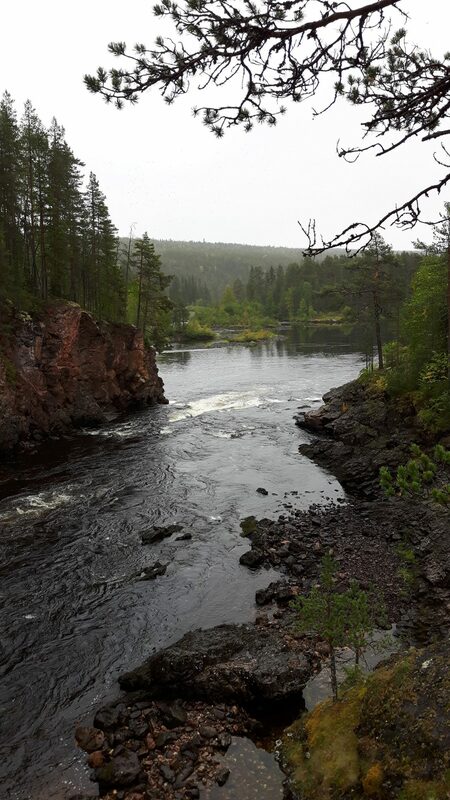 Bioavailability was studied with passive sampling (diffusive gradients in thin films) and bioaccumulation by collecting and analyzing body residues in chironomus larvae from the field. 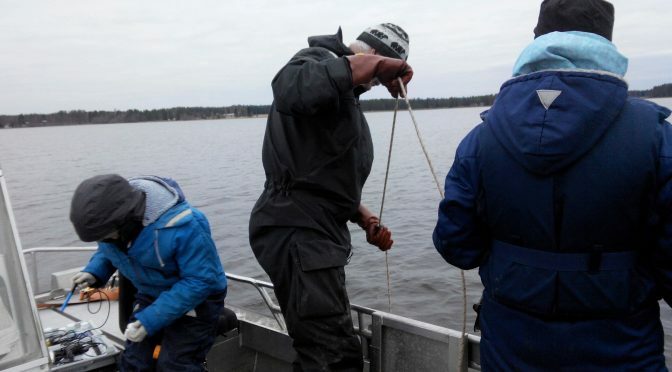 Chemistry and benthic organism community structure analyses showed risks in the most-polluted half of the studied lakes. Clear toxicity was seen some of the tests, but we assume low pH to be the reason of that in most of the cases. Metal body residues were not high enough to induce adverse effects and the bioavailability was not connected to observed toxicities. 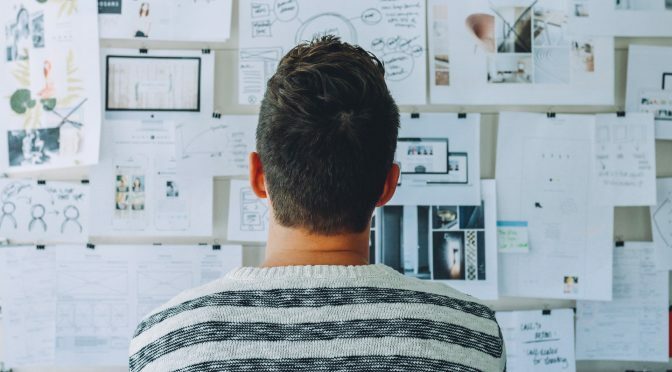 Different methods may lead to totally different results. 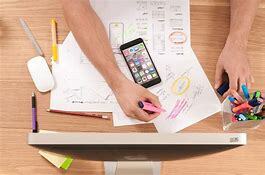 Recommendation: Use several test methods to ensure the reliability of your results. Traditional sediment triad approach includes chemistry, toxicity and benthic organism structure. Since metal speciation and bioavailability are important aspects in toxicity, studies of them should be included. Know your environment. It is easier to evaluate the situation, when you have all the information. One day, we will have enough data to build models for those parts of ecological risk assessment that are still missing. Then, all this knowledge can be transferred to administration and routine environmental monitoring. 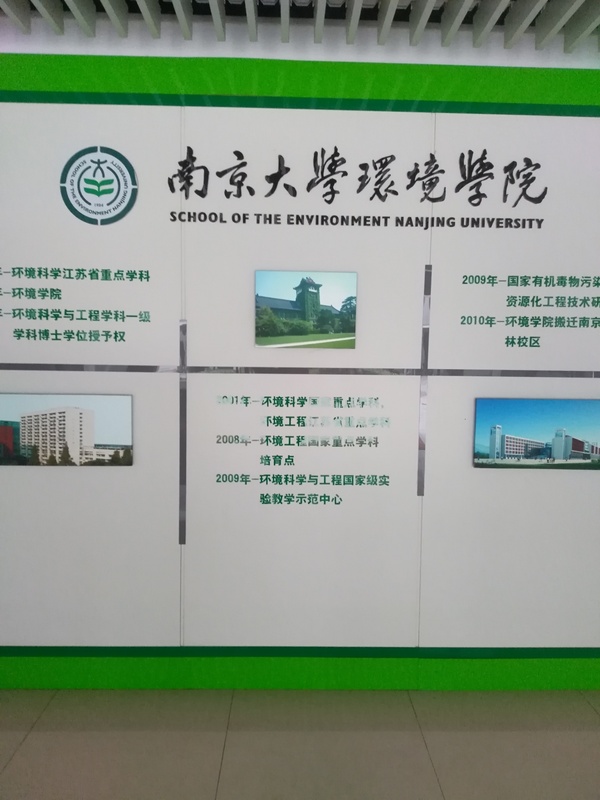 As a partner in the International Institute for Environmental Studies (IIES), the students of the University of Eastern Finland were given an opportunity to participate in the 2nd IIES Graduate Students Forum in Hong Kong. Our PhD student Timo participated in this forum that was held November 2-3, 2018 at the Hong Kong University of Science and Technology (HKUST). The forum was conveniently scheduled right after the 11th Sino-French International Workshop on Contaminated Soil Remediation in Guangzhou, where Timo and another PhD student in our group, Bhabhishya participated at the end of October. The topic of the Graduate Student Forum was water and soil contamination and remediation. For two days, graduate students from all over the world presented their research. 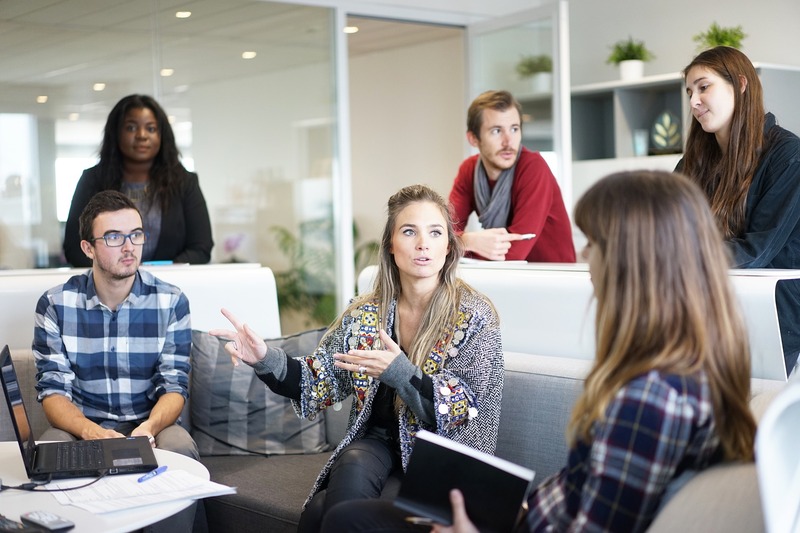 Talks and discussions were also organized on the topics of writing a good scientific paper, how to get along with one’s supervisor and how to manage time during graduate studies and research. Timo represented our Ecotox group at the forum and gave a talk about his research topic “Environmental risks of chemicals in effluents discharged from municipal wastewater treatment plants”. 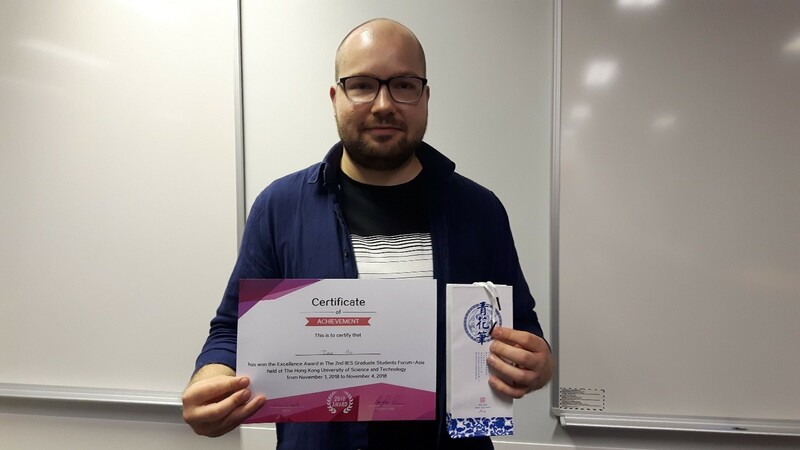 Students who performed well in the forum were given awards for different achievements and Timo was awarded for his presentation skills in the forum! 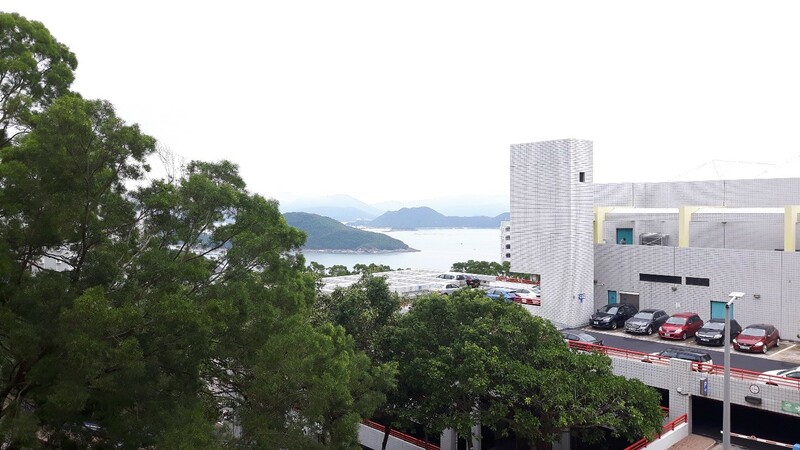 The HKUST campus provided an outstanding arena for the forum. Located at Clear Water Bay, the surrounding landscape is one of the most beautiful in all of Hong Kong. 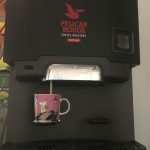 The facilities at the university were also excellent. It is already a great privilege to get to participate to activities like the Graduate Student Forum but to have this kind of event in such an excellent location is truly a dream come true. Timo was extremely happy with the experience of participating to the forum. Getting to know new people in our field, hearing different views from students around the world on graduate studies and getting to listen to the diversity of student presentation subjects, what more can a graduate student hope for! 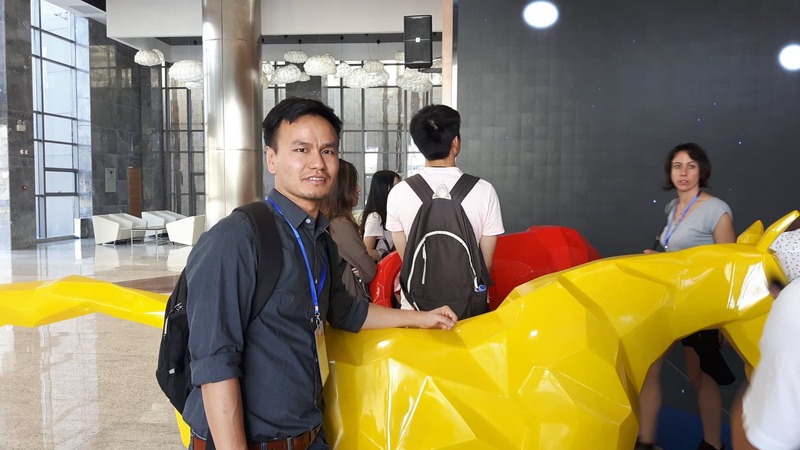 Our Ecotox group has been involved in many IIES activities before and Timo certainly hopes that more opportunities like this will arise in the future. The University of Eastern Finland is one of the 17 partner universities of International Institute for Environmental Studies (IIES). Our Aquatic Ecotoxicology group has been involved in most of the scientific conferences organised/partnered by IIES. 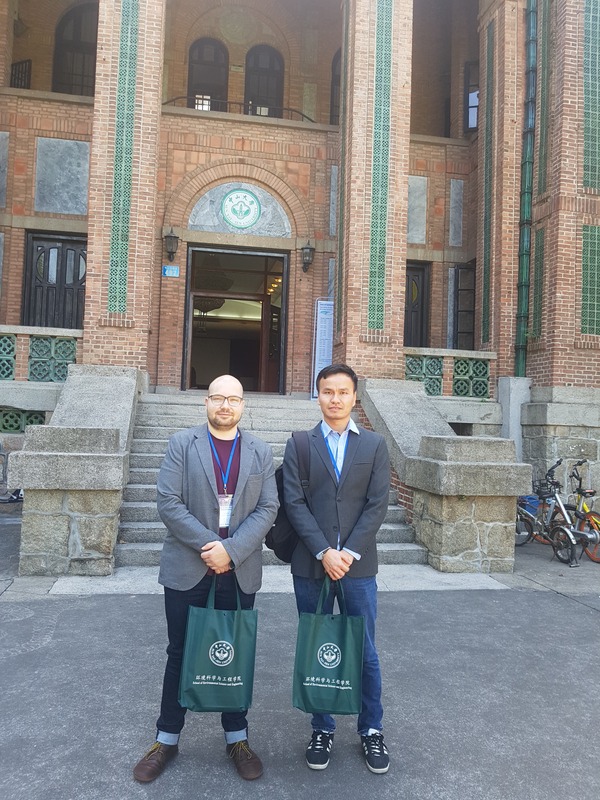 This time two of our PhD students (me and Timo) participated in LIA Ecoland Workshop 2018 held in Guangzhou, China from 29th October to 2nd November. The workshop, 11th Sino-French International Workshop on Contaminated Soil Remediation, was held at SunYat-sen University by ECOLAND. 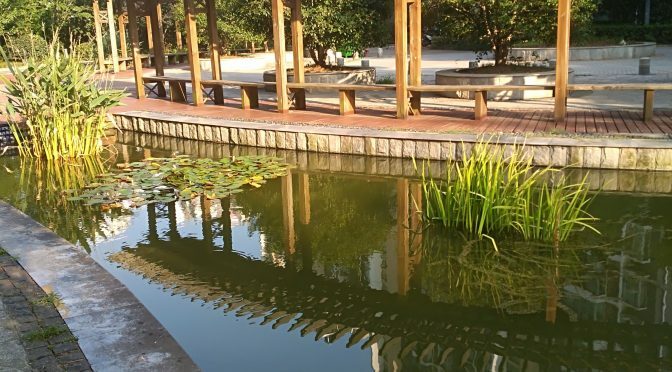 The joint lab ECOLAND, created in December 2015, is the outcome of a fruitful cooperation between two laboratories, the LSE of the University Of Lorraine (UL) and INRA and the LEPCRT of Sun Yat-sen University (SYSU), around pollution issues and remediation of soil and water. The LIA ECOLAND project is to help restore value to territories marked by persistent pollution, and to support the development of ecosystem services through the implementation of appropriate strategies for the management of polluted sites and soils. IIES covered the travel expenses plus the visa fee whereas the food and accommodation in Guangzhou was covered by SYSU. The main objective of the workshop was to develop innovation for circular economy for abandoned secondary resources such as polluted soils, wastes and sediments. One of the focus was on Agromining and/or Phytomining. The main aim is to identify flora that can grow on polluted or abandoned mining sites for recovering the heavy metals from such sites. The heavy metals are then recovered from the biomass by bio-refinery. It was interesting to know about the use of plants for soil remediation as well as for metal mining. The workshop had 2 days of scientific exchange (presentations, posters) and 2 days of field trip. Unfortunately, none of our students had any poster or oral presentation for the workshop. However, it was nice for both of us to participate in such conference (This being first for both of our PhD students) and interact with researchers from other universities and research facilities. The participants were mostly Chinese and French (Obviously!) with few more from Europe, Asia and North America. Apart from the presentations, the workshop also had 2 days of field trip. 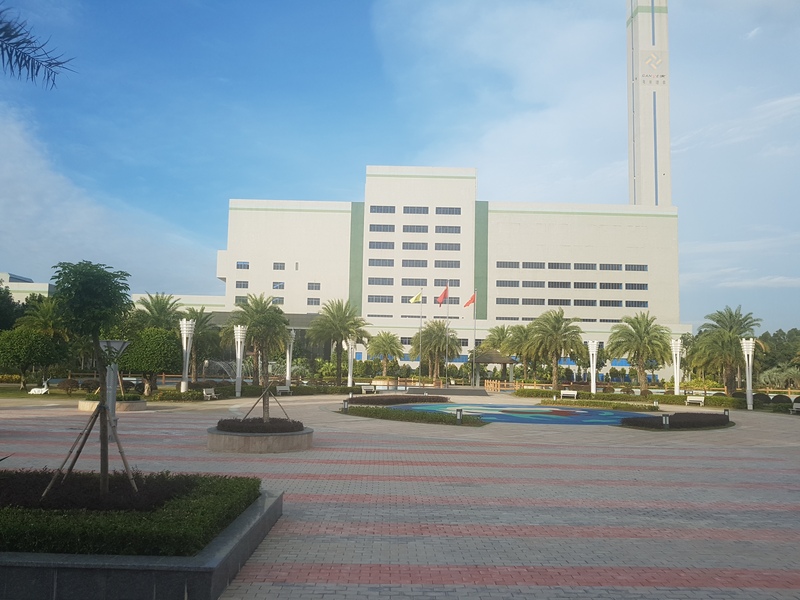 The first day of the field visit was to nearby city of Dongguan. There the participants visited a municipal waste treatment center operated by Canvest Environ Group Co. Ltd. An exhibition building next to the treatment plant had things made out of waste material for exhibition. On the second day of the visit, we were supposed to visit food waste treatment plant in Schenzen, China. However, there was a last minute change of plans and we went instead to China National Gene Bank close to Schenzen. Timo, however, had to go to Hong Kong on the same day to attend The 2nd Graduate Students Forum. So, he could not join us for the second day of the field visit (and he did not miss much). After the visit to the gene bank, we headed to a Hakka Museum nearby. Hakka are the subgroup of Han Chinese who migrated from North China to South and settled in Guangdong (where we were) and neighboring areas. Besides the workshop, there was not much to do as most of our time during the day was taken up by the workshop. 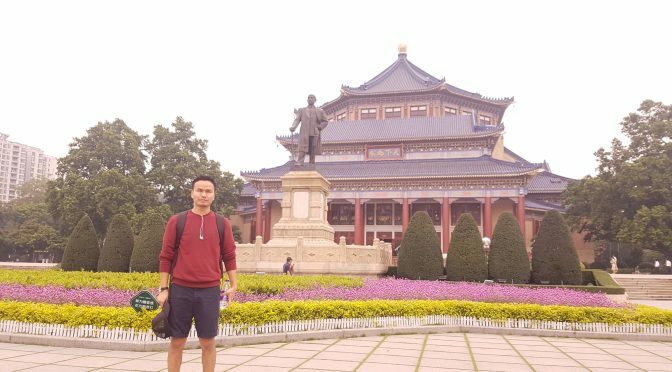 However, I managed to have some free time on the last day of the trip and go to few places in Guangzhou. When in China, you have to eat and shop. Things are so cheap there. But the only problem was of the language. And, since everybody thought I was a Chinese (Because I am of Asian ethnicity from Nepal) my first words were “Not Chinese” in all the places I went for the whole week. The food was especially good (and no Potatoes for a week). In all, the trip was a fruitful one. Hope we will have something to present in our next conference and maybe we will have some interested students in future working in agromining at our research group. 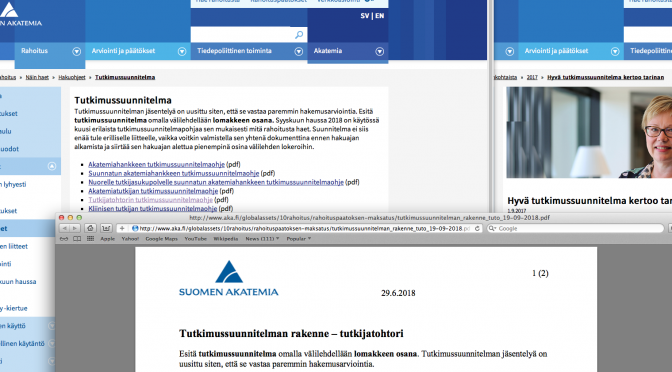 Suomen Akatemian deadline lähestyy – oletko valmis? 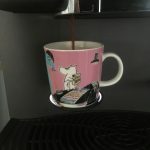 On se aika vuodesta, jolloin tutkijat istuvat tietokoneidensa ääressä hakemassa rahoitusta tuleville vuosille. Meidän alalla kiihkein hakuaika on syys-lokakuussa. Säätiöiden hakuaikojen päätyttyä ei ehtinyt levätä, sillä Suomen Akatemian deadline häilyy jo nurkan takana. Postdoc-tutkija Krista täyttää ensimmäistä kertaa tutkijatohtoreille asetetun liikkuvuusehdon (väitöksen jälkeen min. 6 kk työkokemusta muualla kuin siellä, missä väitöskirja on suoritettu). Tämä tarkoittaa sitä, että nyt on ensimmäinen mahdollisuus hakea omaa tutkimusrahoitusta Akatemiasta. Laajuus. Ei ole helppoa kirjoittaa 15 sivua tieteellisen tarkkaa asiaa niin, että teksti pysyy ymmärrettävänä, selkeänä, johdonmukaisena ja mielenkiintoisena. Budjetti. Kolmivuotisen projektin budjetti on selvästi suurempi kuin aiemmissa hakemuksissani. 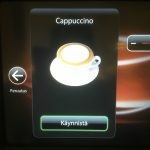 Kokonaiskustannusmalli tuo myös omat kiemuransa budjetin suunnitteluun. Huolellinen budjetin valmistelu kannatti, talousosaajamme hyväksyi budjettini ensi yrittämällä. Ajankäyttö. Tutkimussuunnitelman, budjetin ja liitteiden (kutsu ulkomaiselta yhteistyökumppanilta, CV, julkaisuluettelo, aineistonhallintosuunnitelma) valmistelu on hidasta. Onhan kaikki tiedostot nimetty oikein ja onko asiakirjojen asettelu ja kieliasu johdonmukaista? Moniulotteisuus. Tutkimuksen ydinkysymysten lisäksi mietinnässä on kansainvälinen merkittävyys, uutuusarvo, merkitys tiedemaailman ulkopuolella, tasa-arvon ja kestävän kehityksen huomioiminen, omat ja yhteistyökumppaneiden valmiudet, tutkimuksen riskit, vaikutukset urakehitykseen, tieteen avoimuuden kehittäminen. Tämä ensimmäinen hakukierrokseni on opettanut jo paljon uutta! 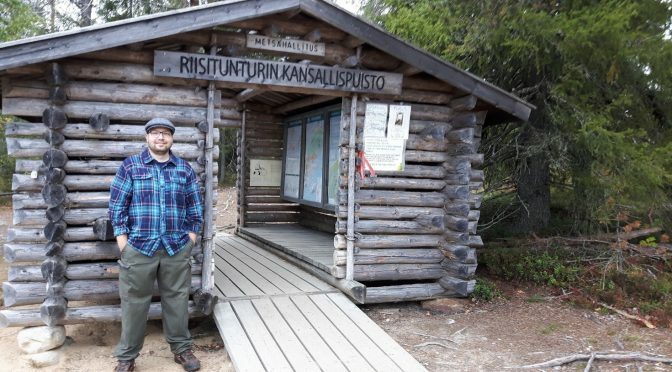 Kun tutkimussuunnitelmaa joutuu miettimään niin monesta näkökulmasta, kirkastuu tutkimuksen tarkoitus ja kulku itsellekin päivä päivältä paremmin. Vielä on viikko aikaa hioa ja parantaa. Tsemppiä kaikille kanssahakijoille! 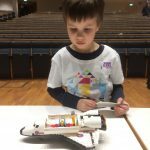 Joensuu has been hosting the annual international science festival SciFest® already since 2007, bringing together thousands of school kids, high school students, and teachers to discover new experiences and learn about science, technology and the environment. SciFest takes place every spring and is free and open to everyone. 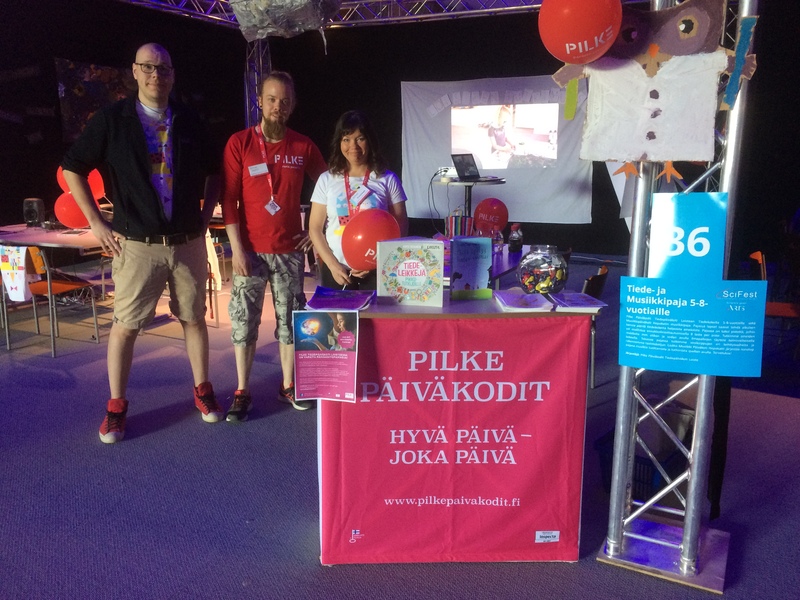 This year was a very special year, since for the first time in the history of SciFest, also early childhood education, Pilke Päiväkodit, was represented as an organizer of a workshop. Early childhood educators of Pilke Loiste and Hepokatti ready to welcome the first visitors to the workshop. 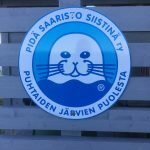 In the neighborhood of Rantakylä, Joensuu, we have a science-oriented day care centre Pilke Loiste. The day care centre has been operating since August 2017, and has been an excellent addition to the educational diversity of Joensuu. 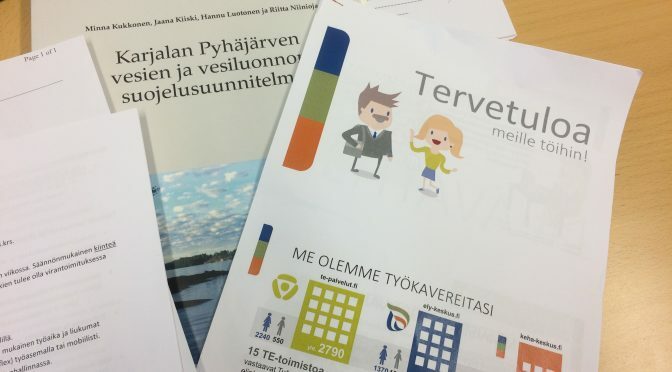 The day care centre Pilke Loiste has initiated co-operation with the Science Park of Joensuu, KideScience and their superb teacher Niko Kyllönen, as well as Luma-keskus and some researchers at UEF. They even participated the Epic Challenge project earlier this year with great success and had a chance to meet astronaut Dr. Charles Camarda. 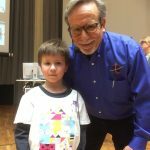 A preschooler meeting a real astronaut at Epic Challenge open lecture. 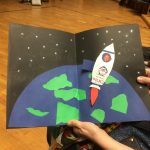 Preschoolers made a card for the astronaut. This is how the space shuttle looks inside. But what does this have to do with our Ecotox group, or this blog? 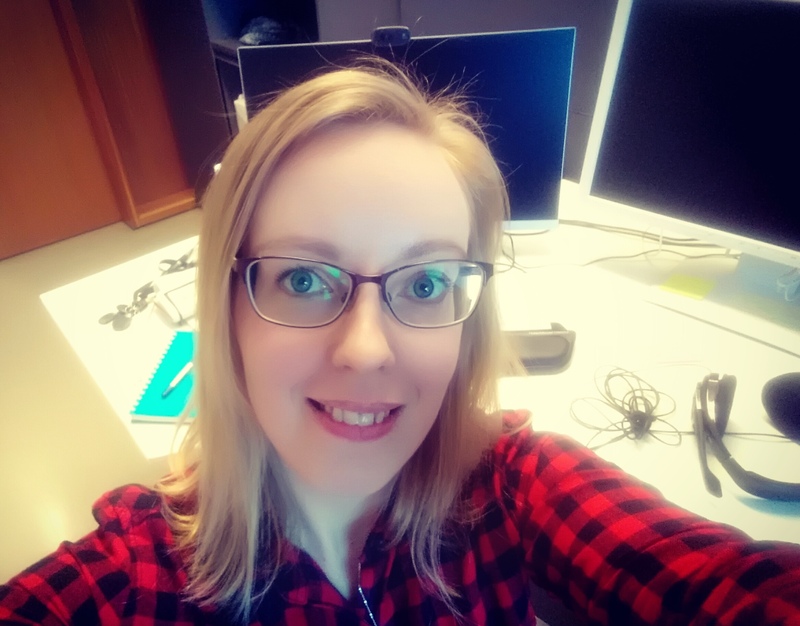 Well, our post-doc researcher Kaisa obviously signed up her two children into Pilke Loiste already months before it was officially opened, and all this has been a huge success in terms of excellent early childhood education AND education in science. 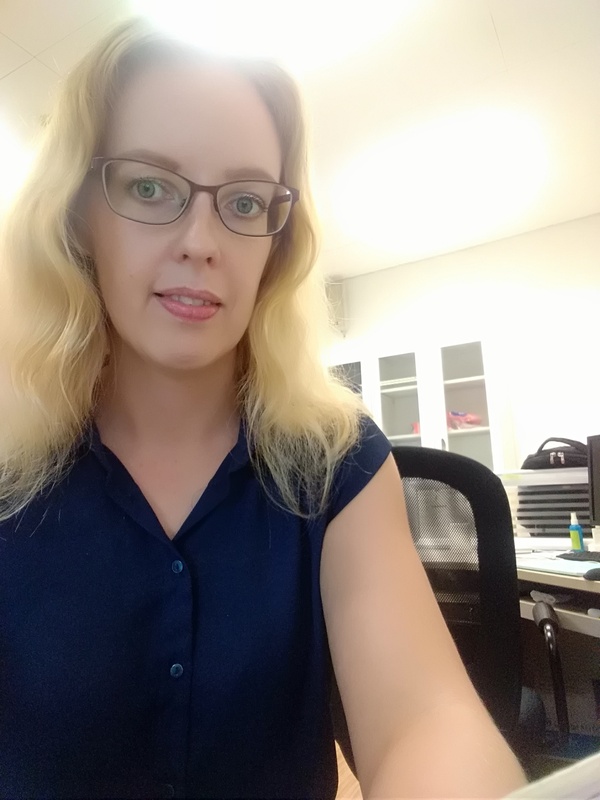 As a mother of two, and as a researcher, Kaisa has been in close co-operation with the day care centre since its early days, and SciFest did not really bring an exception to this either. 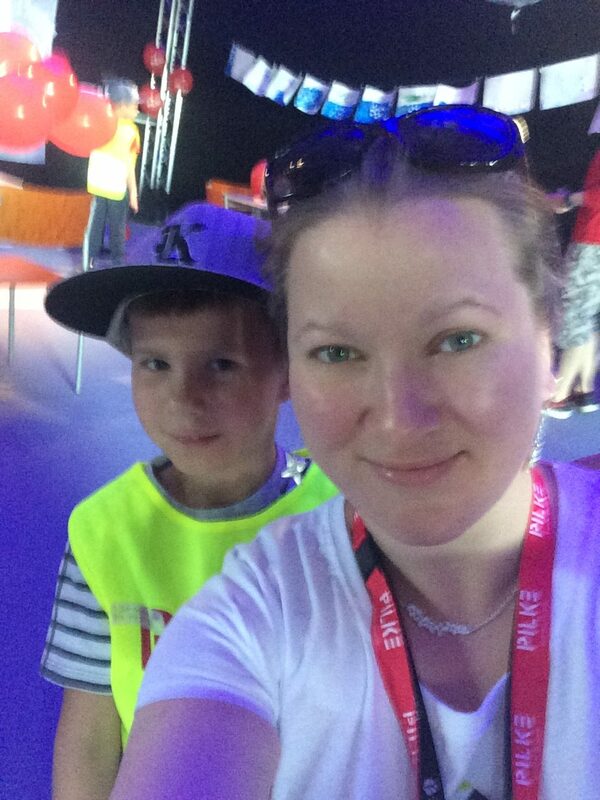 A research scientist and her preschool-aged son representing Pilke Loiste at SciFest 2018. We started to the plan the workshop already months before the actual event. 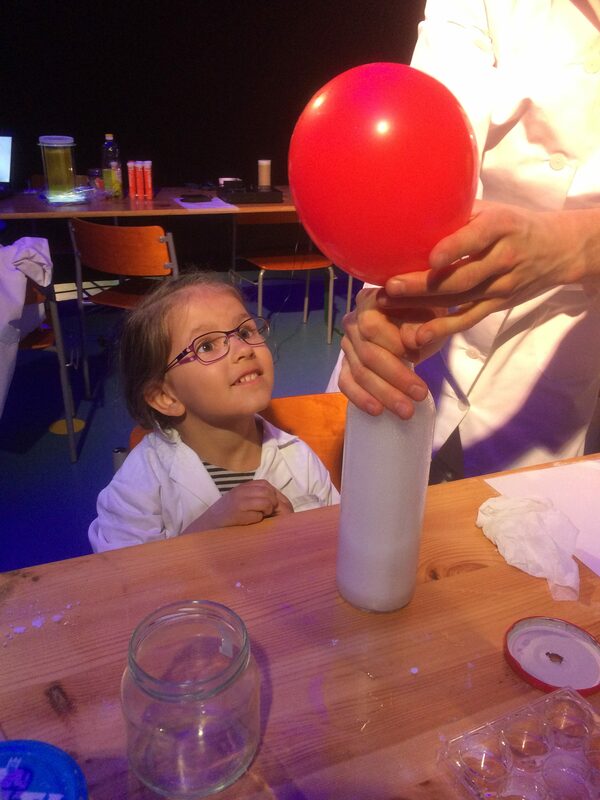 The idea was to combine science with arts in some way, as this was the specific theme of SciFest this year. We joined our forces with a music-oriented day care centre Pilke Hepokatti , located in the neighborhood of Noljakka, Joensuu. Since the target group of the workshop were children between 5-8 years, we wanted to bring some simple scientific experiments into the workshop. 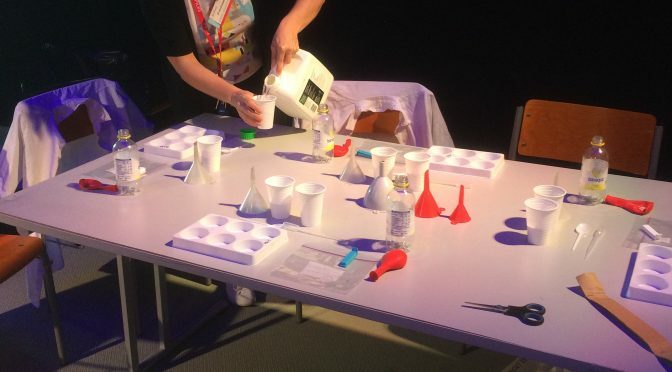 The first experiment was to fill a balloon without blowing – using only vinegar and sodium bicarbonate, in order to make the children understand reactions between chemicals. Another experiment was about surface tension – how many water drops could a coin tolerate on its top before sinking from the water surface? Kaisa then came along with a third task to the workshop – creating a food chain/web together with the children, using special educational cards from WWF, meant for learning biological interactions between organisms. Additionally, on the first day of the festival the kids could also create their own music using iPads lead by the head of music-oriented day care centre Pilke Hepokatti. Pupils from Kanervala school working on a food chain. 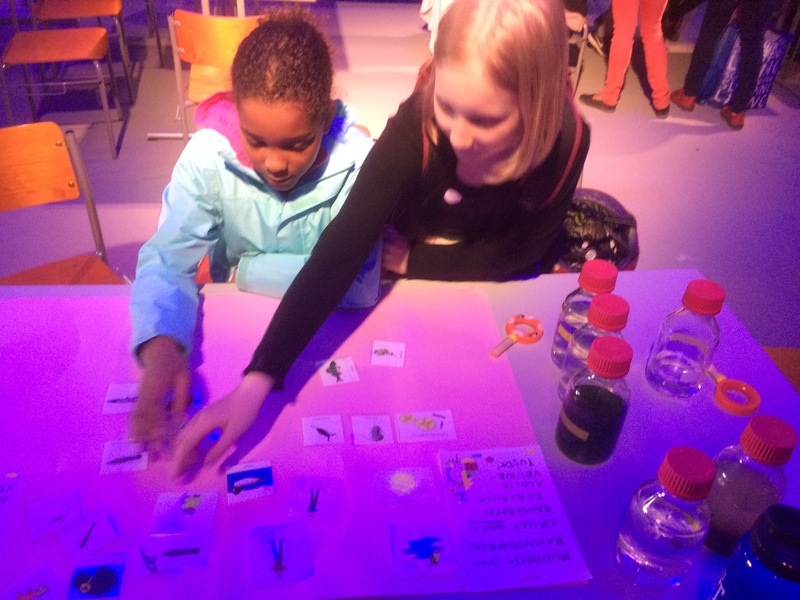 To give a better example of the biological diversity of the Finnish lakes and rivers, Kaisa brought some live organisms (water fleas, Oligochaete worms and Chironomids in real water/sediment) from our culture room to present to the kids. Surprisingly, most of the children had no clue about what a water flea was, or that there exists life also at the bottom sediments of our lakes and rivers. This definitely was a nice opportunity to introduce our aquatic research of UEF EnvBio and Ecotox to visitors of the workshop. We held the workshop during two days, from 9-12 both days, and approximately 60 visitors participated the workshop each day, added with some international groups from Iran and Germany, that were very interested in our workshop and the educational concept of Pilke Loiste in general. The feedback about our workshop was very positive overall. 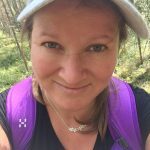 I have been permitted to report now, that the next year 2019 Pilke Loiste will take part in SciFest again as a workshop organizer, and Pilke Loiste has also been invited to join the strategy group of SciFest, to make the event even better in the coming years. This definitely was a huge success, and an excellent opportunity to bring science-oriented education some publicity. Laboratory organisms meet SciFest 2018. 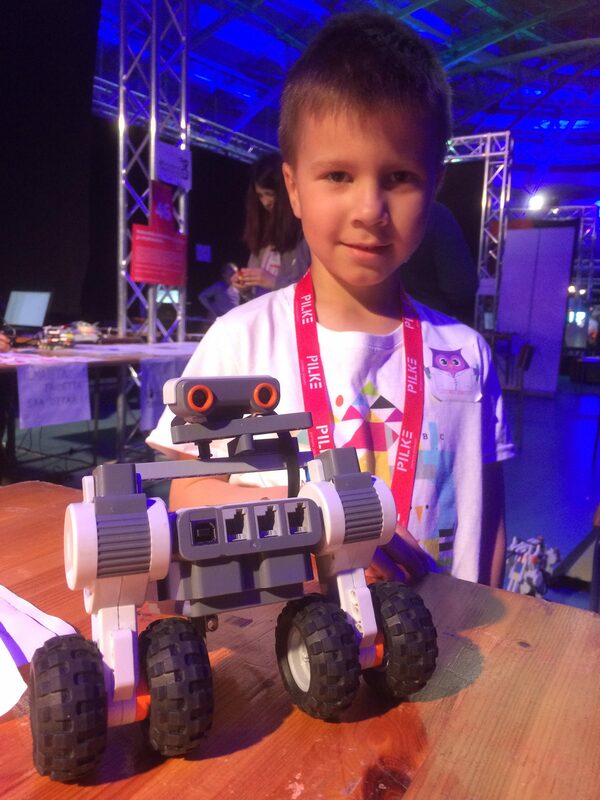 Quick facts about SciFest 2018: More than 9000 participants, over 30 countries, and 70+ workshops. We will meet again next year in April 25-27, 2019!! Due to restrictions in rights of publishing photos of other children, mostly Kaisa’s own kids appear in this blog post (with the kind permission of their mother). Amanda wanted to visit KideScience workshop. Daniel enjoyed the robotics workshop.